"with an output power of 3 kWe and a system mass of 775 kg is" ...patently useless. Much too heavy. What we ought to probobly bring to Mars is a power plant like the SP-100 concieved but never built by the USAF. Not if the bulk of that is water, crap and bugs. I think a microbial fuel cell with that weight migt prove very useful. A 20 kg gas can is only useless if there's no gas in it at time it's weighed. Assuming permanent habitation of a Martian base. All depends on the power grid. Generation, storage, useage. Nuclear for initial convenience, but solar cells for expanded capabilities. Windmills and solar chimneys for dusty periods ? Storage via batteries, Hydrogen and Oxygen for fuel cells, and thermal. manufacturing and construction robots could prepare for comfort. The only problem comes when you consider a leak in a microbial fuel cell would introduce microbes to mars. Yeast, however would instantly anhilate itself due to the cold, ultraviolet radiation, and sudden lack of atmosphere. So... let your microbes do the walking! Microbes are able to live in Martian conditions, see radiodurans. It is acid, vacuum, hot and cold resistant so microbial contamination will be a concern. It would depend on what type of nuclear power plant that we are talking about. Now if we are talking about the first or second generation of nuclear power plant, then you would be right, because they have to be big and massive with a concrete containment dome around it encase of accidents or guard again melt downs and such. You have to have an on site construction of one of these behemoths to be able to build one of these plants. Of these plants it would be impossible or impractical to build nuclear power plants on Mars anytime soon even if we wanted to build them. Now there is a Third or Fourth Generation of nuclear power plant that doesn't need those containment buildings and nor does it use water, but uses gas cooled turbans to do the cooling and they will not melt down even in the worst case possible that could happen to them. This type of nuclear power plant could be manufactured in a factory and shipped to the site that you want to assemble them in there entirety or possibly even just move them one piece if we go to the small side of building such a plant. This Pebble Nuclear Power Plant doesn't use the regular nuclear rods like the older plants do, but uses what called Pebble type. The Pebble would be loaded after it been set into place after the plant been set down and checked out. The fuel part is completely self contained and there would be absolutely no possibility of it breaking open or causing leaks. It works by using one of what called a Pebble that inside the fuel container and then it uses another Pebble inside to generate a continual nuclear action to generate power to run the electric turbans to generate electricity. Now one of those containers that has those Pebble can generate electricity for about 20 years or so, before it uses up those Pebbles within that container. You would then get rid container and get yourself another contain to continue to use your nuclear power plant. In that form they can not leak or cause us a problem, because it locked up in those Pebbles and not sitting out there like a spent fuel rod. It not like we are going to have nuclear waste scattered all over the place in thirty or forty years or so. That not going to happen. We might have a half dozen canisters after thirty or forty years or so with three or four nuclear power plants running full blast. And we would have the power to generate power for maybe a million people or so and the power to run the manufacturing side of the house too. To be able to generate this kind of power any other way, you would have to build probably ten time as much infrastructure or more to generate that much electricity and it would probably be a high maintaince problem too. The Pebble Nuclear power plant would be a low Maintaince and could be managed by just a few people in one location and not have them scattered all over the place to manage the electric generator system. Once the system is up and running a Pebble type Nuclear power plant could probably be managed by ten to fifteen people or so. Because of ease of convince and the fact that it would generate a whole lot more power than with any other system that we could come up with, would make nuclear power the clear choice if we can get them up them. Now whether we can get them to Mars is another story altogether and would need to be addressed too. We may have to put together a skunk works on the Moon to be able to either build or assemble them there and then launch them to Mars for our colonization program. But, to be able to get them to Mars is still in question, but there advantage over other generating process is not in question or it superiority in generate the amounts of electricity that we need to have to colonize Mars. We may use other ways to generate power on Mars, but it won't be the bulk work of what we need to generate power for our Mars colony. I think there may be an argument for a small emergency wind turbine - you can never really have too many power sources in my view - but I still think it would be easier to "make hay while the sun shines" and just store solar energy in various ways: chemical batteries, hydrogen (splitting water), compressed air, methane production, gravity drops and possibly mini hydro. There is no actual need for a nuclear reactor on the first mission to Mars. They don't need that much power. PV is also a lot simpler to set up. It won't need half as much maintenance. Nuclear reactors will require lots of maintenance and engineering staff. A Nuclear accident could leave the astronauts without power, or even worse kill them. The small feeble solar panels of the two mars rovers has pretty much vindicated the use of that technology on the planet already. By the time Mars mission is possible, Solar panels will be a lot more efficient! A few on y'all on this forum are highly irrational, and probably get boners from the idea of nuclear power. Good points there Gregori. LOL about the nuclear boners! I think the development of ultra thin PV film could be the crucial development. Such film already exists - it's coming off the production lines now. If this film can also be made "brittle proof" for Mars conditions, then we could simply spread it out over a large area say 10,000 square metres. My calculations suggest we could generate something like 400KW average for 24 hours a day from such an area with a mass of one tonne or possibly less. MOre than enough for a six person mission - and allowing for lots of small scale industrial activity. Yes, I the manufacturers are being a bit circumspect about releasing details. I think I have seen some scientific abstracts for thin film suggesting the film has been tested at -40C (which doesn't mean it can't go any lower). Obviously this is something that needs more investigation. I'm not guaranteeing it's a solution. But a Mars landing is not going to happen next year and the technology is advancing. If necessary I would say drop thin film and go for something like the Mars Rovers panels. If necessary I would build in another ten tonne robot pre-mission to take ten tonnes of Rover-style panels to the surface of Mars. However, I am reasonably optimistic that we can solve the brittle problem. Well, for me it's been a good Christmas, already! "Technologies to generate clean electricity - primarily solar and wind power - are being developed rapidly; but we can't use that electricity for many of the things that oil and gas are used for today, such as transportation and global energy trade," notes McGill University professor Jeffrey Bergthorson, lead author of the new study. 2) Then I though, I would like to make liquid air with a windmill, and use that at the "Steam" for such an engine. So, I searched the internet about it and got another present! While they are all good, my preference will be that eventually perhaps the windmill will use it's blades to radiate heat, and that electricity will not be involved, except for it's control mechanisms. No electric generator, a liquid air generator. But for now the above will serve nicely, thank's Santa. And we could superheat Hydrogen or Natural gas with it. Certainly superheated Natural gas might be able to reduce the iron powder back to usefulness for powering a car. Obviously the people that are working on item #1 have something in mind. That can be pushed in to an old oil field to bring it back to life. So, the whole process can be almost Zero Carbon. (Of course it also allows oil to be extracted, but that is not a direct part of the process). Therefore, we can have an alliance with the most stringent environmentalists (Not the tin foil ones), And we can cut the sugar to the people on the planet who like to attack us, and have a nice life. I'm not sure whether this should be its own thread, or if it's already been discussed, but I think something worthy of consideration is power distribution for the colony. The traditional method for this since the first current wars has been Alternating Current (AC), which has the advantage of easier conversion of voltages between the main transmission lines and customers, but which involves more losses at high distances over High-Voltage Direct Current (HVDC). I think the colony, especially in its earlier years, would use AC since distances are likely to be small due to colony size. That, however, raises the question as to which AC system (i.e., phase, voltage, current, etc.) it would use. This would be most prominent as to what plug it would use. I think since many household appliances would be imported from Earth (as they would be unduly difficult to manufacture at the nascent colony) by the colonists, the colony's choice would likely reflect the dominant nationality of the colonists (i.e., a primarily American/Canadian colony would likely use an American/Canadian plug, a European colony a European plug, etc.). This, in turn, would likely vary by colony (there might be, for instance, a primarily American-backed colony somewhere, a European-backed one elsewhere, etc. ), leading to, IMO, the necessity of HVDC lines connecting the unsynchronous systems as Martian globalization takes place, and maybe even a "universal plug" from which adaptors to the different local plugs could be made. Just my two cents. Depends on system source and storeage means as well too as to what means we will use for its transmission of it from source site to destination. If solar is the source of geration of the power then that leads to DC and batteries with power convertors being used locally at each device or via one larger unit to create AC for off the shelf standard units to be attached to. Then there is the use of non standard cots items that are custom designed for unique applications that will require the power useage to be designed from the get go. Indeed. I personally think a lot of the larger applications, like greenhouse heat, and some of the more essential ones, like the air pressurization apparatus for the colony, would have their own power sources or generators, either exclusively or as backup, either to accommodate their own power needs or as a failsafe whenever blackouts happen. As for the original question of generation, I'm pro-nuclear for a colony that is mature enough to handle the waste, but I think either solar or a biofuel-powered power plant is the way to go for a small nascent colony. Nuclear would be nice if we had an abundent working fluid to cool the reator with. Sure we could use RTG's or pebble reactors and multiple solar technologies. Working fluids by verture of temperature rise or of cooling produce AC but that means any storeage would convert this to some other form which has lose of conversion and to provide the stored energy later also comes with a penalty as well. I agree that we will want multiple systems to create power as a failsafe for the areas that require 100% 24x7 useages. That is why we are also looking at plants, other life forms (bacteria, algea & animals) and solar to provide a surplus that we can store. Biofuel is not a good thing as the one thing Mars lacks is oxygen to burn it with but as a low cycle of use its probably a good bet for rockets as we are heading down the path to use methane and lox for the Mav. I forgot that we needed Oxygen to combust things lol, I guess that rules out any traditional coal or oil power plant. For nuclear, I would gander that perhaps a colony mature enough to be able to handle the waste of nuclear would be able to either import or make coolant. IIRC, the most common coolant is water, which the colony might mine and process from the regolith, in which case the challenge would be cooling it. I think the colonists would use some sort of Flywheel storage on their grid; it is essentially taking the power and accelerating a flywheel to a high speed, storing the electrical energy as rotational energy of the flywheel. The energy could then be harnessed back by slowing the wheel down. This would store some excess energy for later, and hopefully reduce some immediate production needs of the plant. Also, in my city (Chicago), and I would assume several others, ComEd (the power company), is installing some "smart meters", which relay the amount of energy used by a household to the power plants, allowing certain trends in usage to be determined. I think this would be a further boon to power in the colony. I think that we have discussedf flywheels before here on newmars and its about the loss rate which back then was not what we would need for a system but lets look at where we are with the technology. Maybe multiple units might fit the bill but the foothold on mars has taken....and the correct manufacturing capability has been made available for the colonist to make use of. My understanding of flywheel technology is that friction losses prevent them from general usage as an alternative to storage batteries. But there is a niche use that has worked for some time now: slow input but a fast stop, so that low power can charge them, but extreme high power can be had as a brief output pulse. This sort of thing was used to power shots from laser and particle cannons. With nuclear its related to fuel type and amount of protective shielding and cooling fluid used for the reactor core. With solar its the efficiency of the cells, amount of them required to make energy levels sufficient and then the mass of the batteries needed to store it for later useage. Can helium-4 be mined on Mars or imported in the Solar System, and be fused into nitrogen-14 ? Such fusion create energy; the by-product nitrogen-14 contributes to terraforming effort. To produce Nitrogen-14 (aka 14N), would require Triple-alpha to convert helium to carbon-12 (12C), then 3 steps of the CNO Cycle. This requires intense heat and pressure. But for fusion reactor I think there is another contendor to think of in Helium-3 (He-3, also written as 3 He as RobertDyck deminstrated above) ; it is a light, non-radioactive isotope of helium with two protons and one neutron, in contrast with two neutrons in common helium. So why does He3 fusion (3He + 3He → 4He+ 2p) create He4 + 2 protons instead of Beryllium? (or any other arbitrary rearrangement of the protons & neutrons)? That when you should look at the number of protons and also the number of neutrons. Deuterium contains one proton and one neutron. That makes a +1e core. Helium 3 has 2 protons and one neutron - That's +2 core. Fusing (3, 2)He + (3, 2)He would give (6, 4)Be, which is not existing isotope or its so unstable that it immediately decays to He(4, 2) + 2 p(1, 1). many of the same techniques and technologies can still apply to what we do on mars. 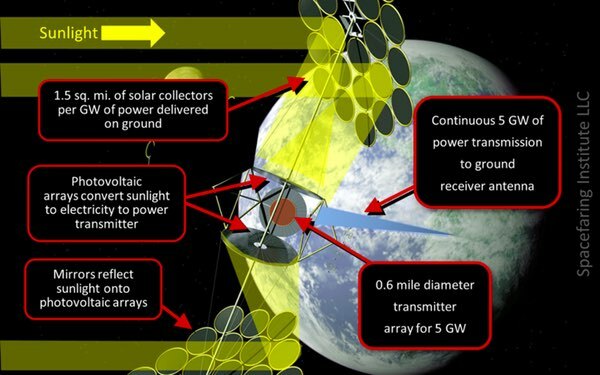 This is a GIANT solar power satellite: 1.5 square mile of solar collectors per GW! 0.6 mile diameter transmitter! 5 GW power to ground receiver antenna! Are they serious? This is huge! This is expensive. And would you want to live anywhere near a microwave beam with 5 GW power? The word "fried" is an understatement. My kitchen microwave oven is measured in watts, not gigawatts. But all solar power satellites have a few common problems. First, beamed power is very inefficient. Only a fraction of power transmitted gets into the power grid on the ground. Second, it's extremely expensive to build. Third, extremely difficult and expensive to service/maintain. You would be better off building a solar power generation system on Earth. Building in a desert means parts can be delivered by truck instead of rocket. That's a lot less expensive. If something breaks, a technician can drive over and fix it. No need for a space shuttle, and no spacesuit. And remember, NASA doesn't have a working shuttle any more. Power is delivered by power transmission line, which is a big power cable. There is some power loss over hundreds of kilometres (or miles) but only a fraction of the power loss of beamed power. And on Earth there's no sunlight at night, so on average half of a 24-hour day. But the best beamed power efficiency is 30%, and over hundreds of km from orbit, or 36,000 km if from geostationary orbit, that's much lower efficiency. So with a ground power station only producing power during daylight and power loss due to long distance power cable, that still results in higher efficiency than beamed power from orbit. Los Alamos National Laboratory discovered a new photovoltaic chemistry in year 2000: gallium-indium-nitride. The top junction of space photovoltaic cells today is gallium-indium-phosphate, so that just changes the doping agent. This new photovoltaic cell has never been finished; the government lab went to U.C. Berkeley to build a proof-of-concept cell and do materials characterization. They did, and it worked. An 8 junction cell would produce 70% sunlight to electricity conversion efficiency. You could cover the roof of a house in these. Mount then on a copper manifold with water running through, to carry away heat. Use the same thermal compound as the heat sink for the CPU of your computer, it transfers heat from a semiconductor to a metal heat sink. And cover with a PCTFE polymer sheet to keep out snow, rain, and hail. That's the second most transparent polymer known to man, highly UV durable because UV just shines through, and doesn't become brittle until -240°C. That's far colder than the coldest environment on Earth, so you don't have to worry about winter cold. Coat the plastic sheet with Teflon AF, which is the only polymer more transparent than PCTFE, has the lowest optical index of any polymer, and the only polymer that is a true amorphous. That makes the coating both scratch resistant, and anti-glare. Then stretch multiple films of PCTFE between the sheet and the photovoltaic cell. The multiple films form a multi-pane window, for thermal insulation. Don't apply the coating to films, just the top sheet. Also run air through the gap between the bottom film and the photovoltaic. That means this can be used to heat water, or heat air. Photovoltaic cells fail when they become so hot that solder melts, pealing connection wires off. So keep the cells cool enough that they don't de-solder. And the heat can be used to heat the house, or pre-heat water for the hot water tank. Combine this with a batteries in the basement (Tesla PowerWall), windmills in the back yard, and geothermal heat pump. And a well sealed and insulated house, with a heat exchanger. All this will mean the house never purchases energy, even in Winnipeg Canada, or North Dakota. Size the system to be energy independent during the worst, coldest, darkest weeks of winter. During all other times, it will sell power to the grid. So money flows in one direction only: from the power utility to the homeowner. No natural gas or fuel oil service to the house at all. You never get a power bill, instead you get direct deposit to your bank account every month, with an email statement. More money in summer, least during the coldest months of winter, medium amount spring and fall. Size it so money you get over the year, when averaged, will pay for one land line residential telephone with custom calling services and a few minutes of long distance calling time, plus cable TV with premium channels but not pay-per-view, and high speed internet but not extreme speed or commercial website, plus burglar alarm monitoring. You could build the house in a suburb with well water (modern electric pump), and add a grey water sewage processing system, so no water or sewer bill either. The result is the house pays its own utility bills. Such a house would cost a little bit more. But price it so the total of mortgage payment plus utility bills is a lower total than a conventional house. As long as municipalities don't increase property tax, this could work. People would by these houses because they save money. With a lower total starting the first month: mortgage + utilities + property tax. The fact these houses are environmentally friendly would make the home owner feel good. In the 1800s, it was common for a factory to have one giant steam engine with a belt driving a single drive shaft. That drive shaft was connected to all factory equipment. Today equipment uses many small electric motors. In the 1980s it was common for companies to have a single large computer, mainframe or mid-range depending on size of company, and dumb terminals on everyone's desk. Today everyone has their own personal computer. Similarly, instead of a giant multi-gigawatt power satellite, each house can generate its own power.